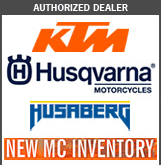 CycleBuy is an authorized Husqvarna and KTM Dealer, offering Husky Accessories, Husky Clothing, New Motorcycle Sales, and service to Husqvarna customers in Oregon, northern California, southern Washington, and throughout many parts of the world. Our large inventory of offroad motorcycle and dual-sport motorcycle accessories already includes most items a Husqvarna owner will want to put on a new bike. CycleBuy has become a leading dealer in the USA for Rekluse Motorsports, Enduro Engineering, Pro Moto Billet/Fastway Performance, Flatland Racing, Dirt Tricks/Ironman Sprockets, and Ohlins stabilizers. We have built our business over the last 10 years, by offering outstanding customer service, competitive pricing, and working hard to make sure CycleBuy customers feel they made the right choice by trusting CycleBuy.com to fulfill their offroad motorcycle needs.